The 8-inch-square, plastic Quick Release Base is permanently glued to concrete or asphalt. The patented reactive spring system ensures the post will return to its original position impact after impact, reducing replacement costs. Removal/install time is 10 seconds by pulling the Quick Release Pin. 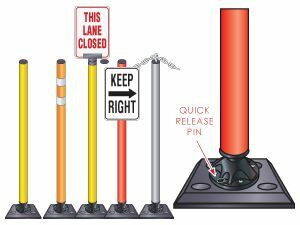 This 48 inch Quick Release Base Gorilla Post is perfect for marking off restricted areas; the flexible design makes it possible to be hit and return to a standing position. Posts are quickly attached to the permanent base using a spring pin. 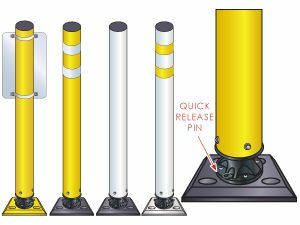 These 48 inch tall 4 inch diameter Gorilla Post™ Bollards are perfect for installation where pedestrian walkways intersect vehicular roadways, and is a high performance channelizer designed to meet the harsh demands traffic delineation. 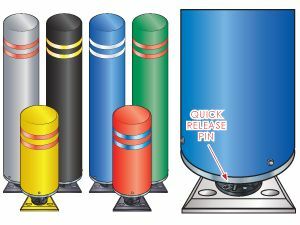 These 7 inch diameter Gorilla Post Quick Release Bollards temporarily attaches to a permanent base, folds over upon impact and returns to an upright position. Available in 48 and 24 inch heights.